WASHINGTON, Aug 7 2013 (IPS) - New signs have emerged in recent days which indicate that extreme measures are being taken in order to suppress evidence of the pernicious effects of the energy extraction method known as hydraulic fracturing, or “fracking”. At the beginning of this month, the Pittsburgh Post-Gazette revealed that, in 2011, a Pennsylvania family reached an unprecedented settlement with an energy company fracking near their property. It included gag orders on the family’s two children, ages seven and 10 at the time of the settlement, which prohibit them from, at any point in their lives, discussing their experiences living near a fracking site. This revelation came only days after the Los Angeles Times reported that it had obtained a set of government-censored Powerpoint slides related to a study by the Environmental Protection Agency. The slides conclude that fracking was indeed polluting the aquifer in question. Critics of the controversial extraction method note that these examples are part of an overall cover-up strategy being employed by the oil and gas industry. “The industry uses its influence in DC to shut down studies by the EPA, while simultaneously using the legal system as a weapon to silence its victims,” Brendan Demelle, executive director of DeSmog Blog, the organisation which obtained the Powerpoint slides and made them public, told IPS. 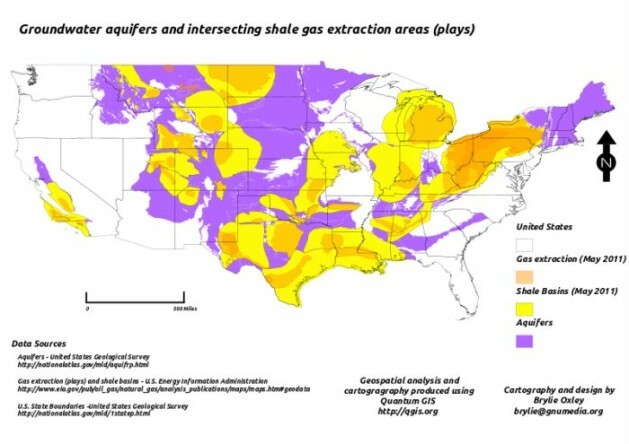 The concluding slide states that “[m]ethane is is at significantly higher concentrations in the aquifers after gas drilling.” Further, it asserts this methane, along with other gases released during extraction “apparently cause[s] significant damage to the water quality” of surrounding aquifers. Dispersed methane is the most notorious pollutant associated with fracking. It is a colourless and odourless gas which, when concentrated highly enough, can spoil water sources, and in some cases make them flammable. According to critics, the pernicious effects of fracking are being obfuscated by powerful companies who profit from popular ignorance. “Advertising and lobbying are deployed by the energy companies to confuse the public, and meanwhile anyone who has suffered from their practices gets a muzzle,” Steve Horn, a research fellow at DeSmog Blog, told IPS. “They use every avenue of our broken democracy to their advantage,” Horn added, referring to the energy companies. The DeSmog Blog activists agree that power and wealth allow the fossil fuel industry to “call the shots” when it comes to fracking. They note that because of this advantage companies can afford “endless legal fees”, a luxury which is out of reach for ordinary citizens who may want to challenge them in court. “It is rare for cases to reach the stage of a full-blown trial. Normally families and individuals wind up settling for less than what they want, because the alternative would be much worse for them,” says DeMelle. In the case of the Hallowich family, whose children are prohibited for the rest of their lives from uttering certain “illegal words” related to fracking, the sum of the settlement was 750,000 dollars. For anti-fracking activists, the Hallowich case is only “the tip of the iceberg”. “The muzzling of a seven-year-old is just an egregious example of the systematic corruption which the oil industry has spent years orchestrating,” Horn told IPS. Fossil fuel companies, according to DeSmog Blog, have gone as far as to hire military specialists with expertise in psychological warfare to deal with residents who try to resist nearby fracking. Horn says he attended a conference in Texas where one energy company spokesperson admitted to this, saying “we are dealing with an insurgency” and recommending industry members read the U.S. Army’s field manual on counterinsurgency. “Rather than taking responsible steps to address community concerns about the inherent risks of fracking,” says DeMelle, “the industry is taking an adversarial approach, treating concerned citizens as an ‘insurgency’ and using military warfare tactics and personnel to intimidate U.S. citizens in their own backyards. “It’s unethical, despicable behaviour, and Congress should investigate whether the oil industry is in violation of federal law,” he added in a statement given to IPS. Other cases of the industry suppressing government studies of fracking effects include one which took place in a suburb of Fort Worth, Texas. There, an emergency order was issued by the EPA after a man complained of his water supply bubbling, only to be rescinded a year later after the oil company involved threatened the agency. In the end, no government action was taken, and the man who complained was left to pay a thousand dollars per month to have access to clean water. Another EPA study conducted in Wyoming connected fracking to water contamination, but again industry manipulation led to no further action being taken, despite some of the contamination being carcinogenic. The EPA was originally slated to release a comprehensive study on the effects of hydraulic fracturing in 2014. The deadline for that report, however, has been pushed back to 2016. This is among the most highly accurate press coverage I’ve seen on the issue of fracking. This powerful industry fouls up many attempts to uncover the real damage it is doing, as surely as it fouls up our air and water. It’s infuriating, on the ground, to see people in “shale country” suffer and go to the ER with respiratory distress, severe nosebleeds, swollen faces and other symptoms even while more common symptoms — burning eyes, headaches, fatigue, and “frac rash” are endured with little medical attention at all. All the while, EPA is dithering around not willing to complete even the incredibly narrow studies they begin on shale gas — and they’ve never undertaken a truly comprehensive study of cumulative impacts to water, air, and heath. The reality is that air contamination from compressor stations, fracking fumes, flaring, intense truck traffic, and processing facilities combines with water impacts to make life unlivable for many in fracking’s path, leading to displaced families and fractured communities. Thanks to IPS for using good sources and providing responsible coverage of the power plays and coverups the shale gas industry engages in. This is high stakes. Good report. Let’s make sure the readers know that it was Range Resources that muzzled the Hallowich children and it was Range Resources’ communications officer Matt Pitzarella who (among others) boasted in Houston of using former Army and Marine PSYOPs specialists in their relations with the people getting drilled. We in PA have to see the Range Resources logo on the ball/strike graphic on out TV screens every time we watch a Pittsburgh Pirates game. Best year in many a year for the Pirates, so Range Resources does not miss a trick in getting their face into that action. Tom, just so everyone knows, you are a paid industry shill. You are funded by the industry and it’s brother industries to confuse, deceive and outright lie to further this industry, regardless of the negative consequences. A shill, also called a plant or a stooge, is a person who publicly helps a person or organization without disclosing that they have a close relationship with the person or organization. How about reading the documents and citing some facts. Schoolyard name-calling hardly accomplishes anything. Read the documents! The Hallowiches asked for the secrecy, not Range. Get your facts straight. Thank you, TSheptone, for providing this link to your article, and to the transcript with your highlights. I had not seen it, in full, before. Sadly, the “truth” of what you write in your analysis may be that you are a hard-boiled, cynical man incapable of any empathy for the position into which this family and their children were put. But that is just my opinion, and what I think of you hardly matters, so again I thank you for making the transcript available and encourage others to read it. You parse and select language of the transcript to build your case that the Hallowich parents agreed to gag their children, even asked for that through their lawyer. What I read, and I think most people will read, is two people with a gun at their head trying to salvage what they can in this agreement so they can get another home in which to live and get their children out of an unhealthy situation. And two people who are fearful, for good reason, that if their children ever uttered a word about the settlement they’d be pounced on again by Range Resources and lose everything. So their lawyer, smartly, gives them a chance to say that their children, being children, might say something that could scuttle the settlement, and the judge duly notes that for future reference. The industry lawyers say they would enforce the gag order against the whole family, so what were the Hallowich parents supposed to think? If you have children, TShepstone, try to put them and you inside the situation the Hallowich family faced. Run a little experiment on yourself and see if, for a moment, you can see it through their eyes. I have children and I would NEVER sign an agreement indicating I never had a case or exploit them the way Hallowiches have. Okay, I see that I cannot expect any empathy from you given the harsh judgment you have made of this family. I guess I could remind you that we are taught “judge not lest ye be judged,” but that likely is a waste of time, too. Take good care of your family, Mr. Shepstone. When we love, then love sometimes breaks through in unexpected ways. The greenies invented psychological warfare with respect to the environment. As for the “you work for the industry” trope: grow up and address the facts, which are there for everyone to see. This constant manipulation hurts your so-called “movement.” If the evidence that “fracking” is bad were so incontrovertible, why do you constantly have to ignore or hide facts, invent impacts and lie? Here’s why, because if you told people the absolute truth you could not manipulate their reaction to it and you would have to find another cause celebre.